Why Choose a Drainable Pouch? What Is a Drainable Pouch? A drainable pouch is equipped with a "tail" that allows you to quickly and easily empty the pouch as needed. This tail is comfortably secured with either a clip, clamp or "Lock 'n Roll" feature when the pouch does not need to be drained. If you have discharge from your stoma frequently throughout the day, then a drainable ostomy pouch may be the ideal choice for you. Ideal for coping with liquid stoma output. Does not need to be changed as often as a closed pouch. Uses less pouches and is more economical from a long-term perspective. Can be easily emptied before disposal. One piece systems are less bulky and much more flexible than two piece systems. One piece systems adhere smoothly to the skin, specifically scarred or uneven skin. We carry many different types of 1-piece drainable ostomy pouch products from several different manufacturers. You can view our catalog of 1-piece drainable pouches here. 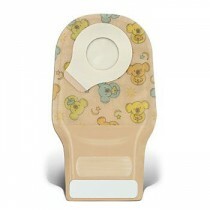 Let's have a look at how to apply your ostomy appliance to keep a tight seal. Remove the protection film from the adhesive by placing a thumb on the white tab on the adhesive and pull the blue release tab away from the adhesive. After having removed the protective film you should even out the edges of the hole by running a finger around the edge. This is to prevent any unevenness of the edge. Remember to close the outlet bag before applying it. When applying the bag to the skin around the stoma, it must make full contact with the skin. Before applying the adhesive to the skin form the edge of the hole in the adhesive to spout shape to face the skin. Apply the bag starting from the lower part of the ostomy. Begin closest to the stoma by pressing the adhesive to the skin. Run a finger all the way around the stoma to ensure that the adhesive seals. Smooth the adhesive down from the stoma out to the edge to ensure that the adhesive has body temperature and has full contact with the skin. Ensure that the appliance is securely attached by a gentle downwards tug on the bag.